So first and foremost let me thank LoserMLW for picking this episode. I probably will have another episode from LoserMLW's picks later, but anyways I wanted to show a better episode than I normally do. Visual wise. So I chose an episode from Hulu. Or LoserMLW did. Anyways, as I want everyone to know there are a number of episodes that anyone can watch off of Hulu. As well, this being November, Shout Factory, the people who make the DVD sets, have a special sale going on. The sale changes from day to day but stays over the weekend. This might be a good chance to pick up some episodes for that Mistie in your life. That said, we're talking about heroes this week. 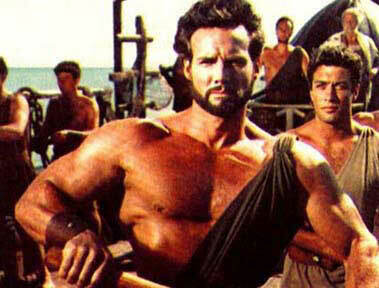 Yes, Steve Reeves was a regular "man's man" in his day. And as my wikipedia research shows he was a bodybuilder, then became an actor in European cinema. Fellini this was not. He actually played a who's who of notable historical figures. His role in Hercules Unchained is great. A series of Herc movies were shown on MST3K, with only 2 of them actually starring Steve. As the "arm's race" between America and the Soviet's heated up steroids became the main tool doctors were using to buff up Olympic bodybuilders. Steve didn't choose to compete for 40 years because of this sort of influence taking over his sport of choice, so luckily he also had a face for the movies. As I stated, he starred as a bunch of different historic figures, and Hercules Unchained is crazy because the figures within. If you know much about the ancient world, then the idea that Hercules and Ulysses are bros is kind of hysterical. And the idea that Ulysses, brave Ulysses, cruel Ulysses is his foil is doubly so. This is the typical "sidetracked" story. Herc is on his way to deal with Eteocles and Polynices but gets sidetracked by the "waters of forgetfulness." And the "dance of Shiva" doesn't help. So we finally get to go back to a Joel episode. Which mean Mike is the guest star. Wait, what? Well, just watch for that. There is some great stuff in this episode. Frank is great as ever. Steve-o-meter is a great invention too. So it's a good quality vid of a terrible quality movie. Maybe this will help people get into the show more. Seriously though, there was a time when you didn't have phonies like Thor on your movie screen, with a pair of arms hidden behind some sort of weird mesh designed for arm hiding. No, your strongmen had to run around in a loin cloth, and it was nips for everyone. The idea of the hero, of the super hero, comes from our friend Herc. And yet that is what makes him such a comic figure. I mean he killed his family, what's funnier than that? There is such a disconnect now, when you have to have a strong man, a guy in a computer generated suit, a big green guy, and more computer generated aliens. When you watch these shows that actually got people interested in this sort of stuff, the Steve Reeve's Hercules films or Harryhausen stuff you remember that nothing is ever going to be as powerful as the stuff you watched as a kid. It worked because magic. Speaking of a disconnect, well, I'm going to break my own rule for the next episode we examine. I did a bit of research and think it would be a fun one to check out, then next week we'll either be doing movies from Japan or giant monster films, or both. Sandy Frank is definitely going to be getting brought up. A parting gift, Hired pt. 1, so you aren't completely lost when we see the ending feature.